Using fresh zucchini spirals and jarred marinara sauce make this pizza-like casserole a breeze to prepare. 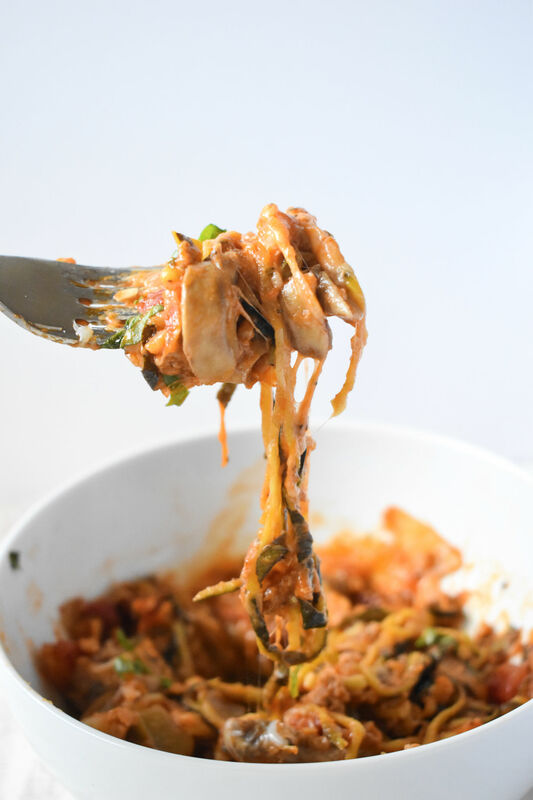 Choose a marinara sauce that contains 6 grams of sugar or less per serving or contains “no added sugars.” Spiralized zucchini is available in the produce sections of most groceries, but you can also purchase whole zucchini to spiralize or shave at home. Serves 6. Spread zucchini spirals over a clean kitchen towel. Sprinkle with salt; let sit 30 minutes. Squeeze towel to remove excess moisture from zucchini. Heat a large nonstick skillet over medium heat. Add garlic and ground beef; cook 5 minutes or until browned, stirring to crumble. Drain; return to skillet. Add marinara sauce, drained tomatoes, zucchini spirals, and pepper. Simmer 3 minutes or until warm throughout. Spoon mixture into a 13-by-9-inch baking dish coated with cooking spray. Heat oil in skillet over medium-high heat. Add onion and bell pepper; saute 4 minutes or until beginning to turn tender. Add mushrooms, stirring to combine, and cook 2 minutes. Drain any excess liquid from skillet. Using slotted spoon, top zucchini mixture with sauteed vegetables and pepperoni. Sprinkle with cheeses. Bake at 375 degrees for 15 to 20 minutes or until cheese is melted and beginning to brown on edges. Garnish with fresh basil, if desired. *Zucchini spirals can be purchased at most groceries in packages ranging from 14 to 15 oz. These typically have 4 to 5 cups of spirals. To make your own spirals, purchase 1 to 1¼ lb. whole zucchini. Trim and then spiralize or use a vegetable peeler to create thin strips.